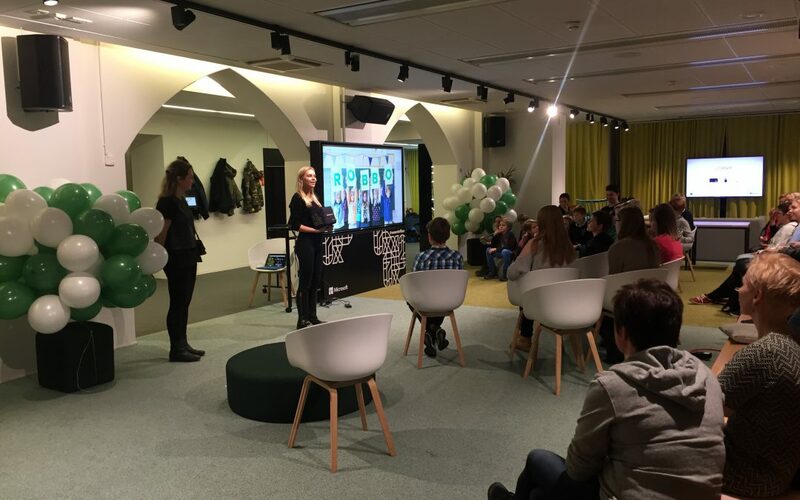 Last Tuesday we celebrated ROBBO™ Contest grand finale with five schools from Finland participating in our current project. We were joined by Innokas team and Juha Paananen, to discuss importance of coding in todays’ society and education, as well as how fun coding can be as imagination is the only limit! As part of the contest the schools had to prepare videos to show how they completed the challenge. The task required use of variety of skills such as programming, robotics, storytelling and creativity. We received amazing results, below are videos from two finalists. This year the winner of the ROBBO™ Contest is Ohkolan koulu! The school won 10 sets of ROBBO™ robots for their school. In addition, to honor EU Robotics week together with Innokas-network we arranged free programming and robotics workshops at Microsoft Flux on the 21st and 22nd of November. Around 200 pupils from 3rd, 4th and 5th grades together with their teachers joined us to learn the basics of coding through new and innovative technologies. We had so much fun that will definitely organise such events in the future!